I got these two Orange Weavers on August 6, 2011 at a Bird Fair and were told they were both females and get along with other finches. 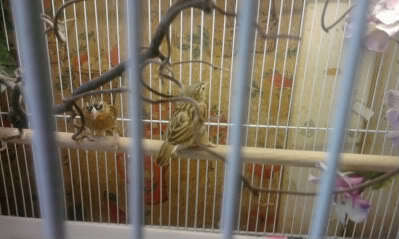 When I got home I researched them and they are one of the most aggressive finches! So I have been keeping them in a seperate cage. 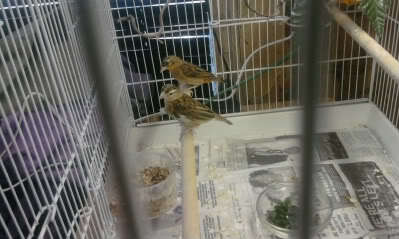 On January 3, 2012 I noticed one of them is getting orange feathers, so I now have a male and female. I took these pictures from my phone, but you can see where he is getting more orange feathers on his neck and back. For the past 5 months they both looked exactly the same. It is exciting to see the color changing and I can't wait to see him when he is done with his breeding plumage. I also know that he will build several nests, and if the female likes one of them he will mate with that female and if you have more females he will do the same with them, you should have more than one female and they should have a large avairy. He will not help to take care of the hatchlings. Since I do not have a large avairy for just two finches and I can't put them in with anyone else I will have to remove the female so he doesn't hurt her when he is finished his breeding molt. On this one you can see where his eyes are getting black and he is also getting black feathers on his chest. 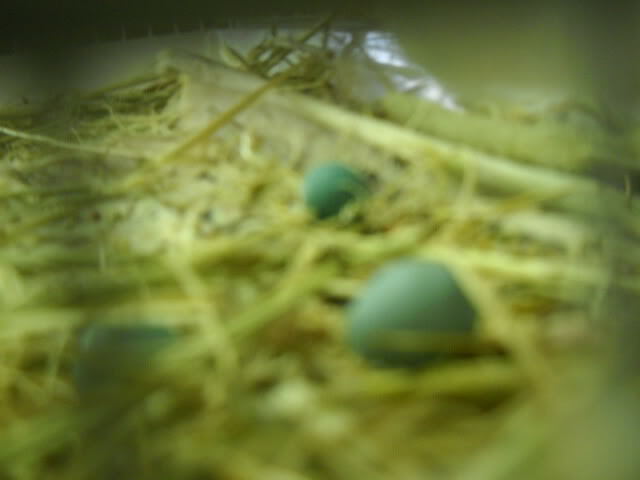 I just found a blue egg on the cage floor of my Weavers cage, I do not remember reading that they lay blue eggs!!! 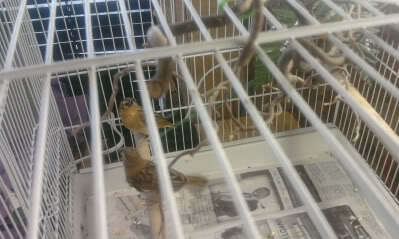 I put it in their nest which I have never seen them in, its an open canary nest. 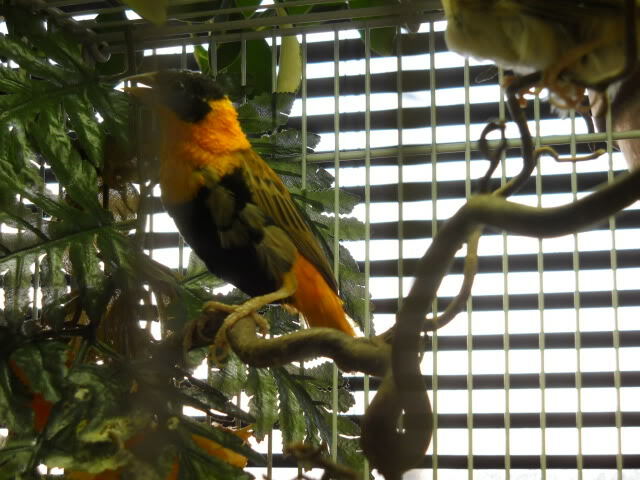 I didn't expect any breeding since he is not in his full breeding plumage, see pictures of my weaver molting,. I also didn't expect anything since there is only one female in the cage and he did not build a nest with the material I put in there and they are in a regular flight cage. He eats the chopped boiled egg but I don't see the female eating it. The egg is also bigger than my other finch eggs were. I wonder if my societies will foster it if she doesn't sit. The female looks like she has more feathers or is molting. I have been watching to make sure he does not harass her and the only thing I have noticed is that when she is eating or sitting on the perch and he comes by her she moves. 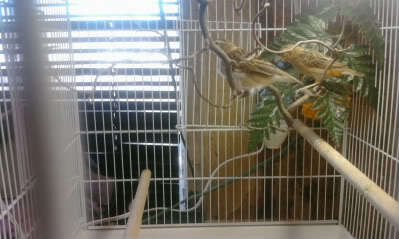 They do not sit together like my other finches. The male has never done any singing, sometimes he makes a sound that sounds like a loud kiss or smacking with your lips sound. I had to watch when I heard this to see if it was coming from him. The next day I found another egg on the cage floor and put it in their nest and then found one more egg on the cage floor, this last egg was smaller than the other two. I left them in the nest for 2 days and no more eggs and the female was not sitting so I took them and put them in the society nest since they have eggs already. The first Weaver egg was found on the bottom of the society cage, there was only a half shell left of it. The other two eggs are still in their nest, but I doubt if they are fertile and didn't expect them to hatch but I wanted to try. I have been trying to find pictures of Orange Weaver hatchlings to see how different they look from societies hatchlings, but no luck so far. The female weaver has not laid any more eggs. The male has not been aggressive toward her but he has not reached his full breeding plumage yet so I will watch them closely for any signs of aggression. He has ever done any singing, sometimes he makes a sound that sounds like a loud kiss or smacking with your lips sound. I had to watch when I heard this to see if it was coming from him.. 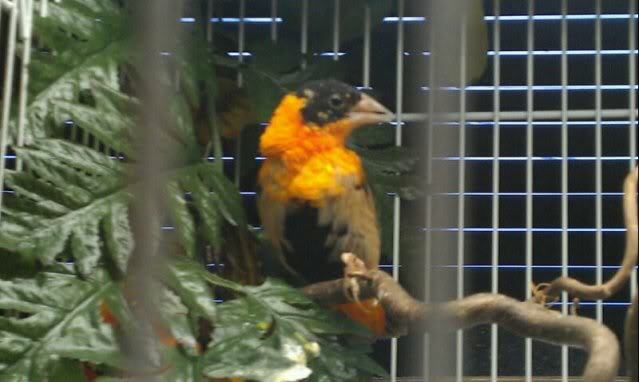 This is my Orange Bishop Weaver when he is in full breeding plumage. Its interesting to see how they molt into their beautiful colors.